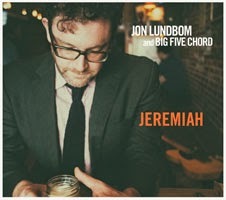 The music on Jeremiah is not so much of a Big Five Chord as much as a big seven. As well as the core quintet line-up of Jon Irabagon (Soprano Sax), Bryan Murray (Tenor/Alto Saxes), Moppa Elliott (Bass), Dan Monaghan (Drums) and Jon Lundbom (Guitar), they are joined by Justin Wood (Alto Sax) & Sam Kulik (Trombone). Even though the ensemble has expanded again, they have lost none of their classic Big Five Chord sound with full-on textures taking turns against more stripped back accompaniments, and fast free-bop tempos being usurped by laid back lounge vibes. We find that Lundbom’s guitar playing is as free and languid as ever, the sound of which is totally unique to himself. The opening track “The Bottle” is half a march and a jog, full of energy in it’s brisk, but not overtly fast, pace containing some great playing from the whole ensemble, which Lundbom uses as a foil to launch a typical free and wandering guitar solo before giving way to some rasping sax playing. In fact, Lundbom gives way quite a lot on this album, allowing the horns to come to the front a lot more and not just collectively but also as soloists. Personally, I would have liked to have heard more of his guitar work up front on the album, but from a compositional point of view Lundbom has taken a very unselfish stance to the situation and has put the music first. “Lick Skillet” starts with what sounds like the drone of an aeroplane, but is in fact an extended technique on the trombone creating an interest that wasn’t expected, before a dancing flute picks up the vibe with some funky melodic playing. Two of the tracks are arrangements of Wiccan prayer songs, the idea first being introduced on Liverevil. The album closes with a live track “Screamer” with the guitar up front and rolling with it’s stream of consciousness playing, for the large part, pitted against the start-stop rhythmic accompaniment of bass and drums. The musicianship on this album is excellent and the band are really together as you would expect. There are seven tracks on Jeremiah and not one of them is a filler, but every one of them is a grower!